[Gr.,=earth measuring], branch of mathematics concerned with the properties of and relationships between points, lines, planes, and figures and with generalizations of these concepts. ..... Click the link for more information. , and in which the approach to geometric problems is primarily algebraic. Its most common application is in the representation of equations involving two or three variables as curves in two or three dimensions or surfaces in three dimensions. For example, the linear equation ax+by+c=0 represents a straight line in the xy-plane, and the linear equation ax+by+cz+d=0 represents a plane in space, where a, b, c, and d are constant numbers (coefficients). In this way a geometric problem can be translated into an algebraic problem and the methods of algebra brought to bear on its solution. Conversely, the solution of a problem in algebra, such as finding the roots of an equation or system of equations, can be estimated or sometimes given exactly by geometric means, e.g., plotting curves and surfaces and determining points of intersection. In plane analytic geometry a line is frequently described in terms of its slope, which expresses its inclination to the coordinate axes; technically, the slope m of a straight line is the (trigonometric) tangent of the angle it makes with the x-axis. If the line is parallel to the x-axis, its slope is zero. Two or more lines with equal slopes are parallel to one another. In general, the slope of the line through the points (x1, y1) and (x2, y2) is given by m= (y2−y1) / (x2−x1). 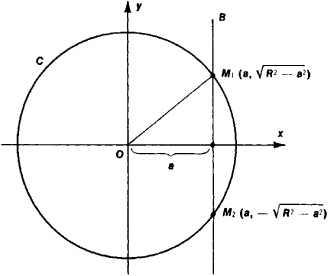 The conic sections are treated in analytic geometry as the curves corresponding to the general quadratic equation ax2+bxy+cy2+dx+ey+f=0, where a, b, … , f are constants and a, b, and c are not all zero. In solid analytic geometry the orientation of a straight line is given not by one slope but by its direction cosines, λ, μ, and ν, the cosines of the angles the line makes with the x-, y-, and z-axes, respectively; these satisfy the relationship λ2+μ2+ν2= 1. In the same way that the conic sections are studied in two dimensions, the 17 quadric surfaces, e.g., the ellipsoid, paraboloid, and elliptic paraboloid, are studied in solid analytic geometry in terms of the general equation ax2+by2+cz2+dxy+exz+fyz+px+qy+rz+s=0. , Lat. Renatus Cartesius, 1596–1650, French philosopher, mathematician, and scientist, b. La Haye. Descartes' methodology was a major influence in the transition from medieval science and philosophy to the modern era. branch of mathematics that studies continuously changing quantities. The calculus is characterized by the use of infinite processes, involving passage to a limit—the notion of tending toward, or approaching, an ultimate value. branch of geometry, based on analytic geometry, that is concerned with geometric objects (loci) defined by algebraic relations among their coordinates (see Cartesian coordinates). a branch of geometry. The basic concepts of analytic geometry are the simplest geometric representations—points, straight lines, planes, curves, and second-order surfaces. The basic means of analysis in analytic geometry are the method of coordinates and the methods of elementary algebra. The method of coordinates was closely associated with the rapid development of astronomy, mechanics, and technology during the 17th century. A precise and exhaustive presentation of this method and of the foundations of analytic geometry was given by R. Descartes in his Geometry (1637). The basic ideas of the method were also known to his contemporary P. Fermat. Subsequent development of analytic geometry is associated with the works of G. Leibniz, I. Newton, and, in particular, L. Euler. The methods of analytic geometry were used by J. Lagrange in the fomulation of analytic mechanics and by G. Monge in differential geometry. Today, analytic geometry no longer has independent status as a science; its methods, however, are widely used in various areas of mathematics, mechanics, physics, and other sciences. unit e, constitute the so-called rectangular Cartesian system of coordinates Oxy in the plane. Straight lines Ox and Oy are called, respectively, the axis of abscissas and the axis of ordinates. The position of any point M in the plane with respect to the system Oxy can be determined in the following manner. Let Mx and My be the projections of M on Ox and Oy and the numbers x and y be the magnitudes of segments OMx and OMv. The magnitude x of segment OMx, for example, is equal to the length of that segment taken with positive sign if the direction from O to Mx coincides with the direction on straight line Ox and with negative sign in the opposite case. The numbers x and y are said to be the rectangular Cartesian coordinates of point M in the system Oxy. Usually they are referred to as the abscissa and the ordinate of point M, respectively. 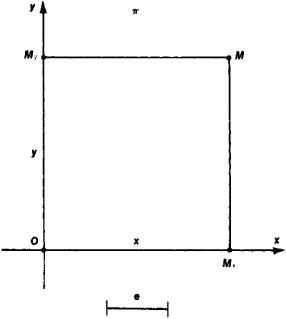 The symbol M (x, y) is used to designate a point M having abscissa x and ordinate y. 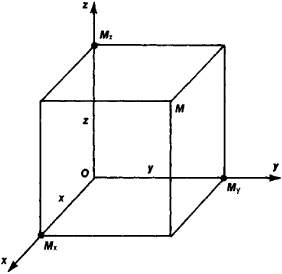 It is evident that the coordinates of point M define its position with respect to system Oxy. theorem we have x2 + y2 − R2 = 0 for triangle OMMx. 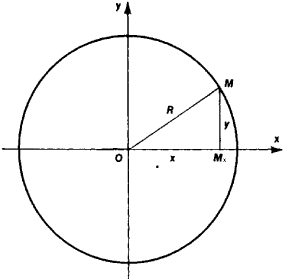 If, however, the point does not lie on the circle, then it is clear that x2 + y2 − R2 ≠ 0. Thus, curve L in the plane can be associated with its equation F (x, y) = 0 with respect to coordinate system Oxy. 3; may have one common point (R2 = a2), in which case the straight line B is tangent to circle C; or may have no common points (R2 < a2), in which case straight line B lies outside circle C.
Analytic geometry studies in detail the geometrical properties of the ellipse, the hyperbola, and the parabola, which are the curves of intersection of a circular cone with planes that do not pass through the apex of the cone. These curves are frequently encountered in many problems in natural science and technology. For example, the motion of a material point under the influence of a central gravity field follows one of these curves; engineering in the construction of projectors, antennas, and telescopes uses the important optical property of the parabola in which light rays proceeding from a certain point, called the focus of the parabola, following reflection from the parabola form a parallel beam. 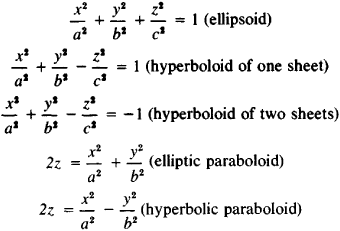 The first of these equations defines an ellipse, the second a hyperbola, the third a parabola, and the last two a pair of straight lines (intersecting, parallel, or coincident). The most important surfaces of the second order are encountered frequently in various problems in mechanics, solid-state physics, theoretical physics, and engineering. Thus, in the study of stresses arising in solid bodies, use is made of the concept of the so-called stress ellipsoid. Designs in the form of hyperboloids and paraboloids are used in various engineering projects. Efimov, N. V. Kratkii kurs analiticheskoi geometrii, 9th ed. Moscow, 1967. Il’in, V. A., and E. G. Pozniak. Analiticheskaia geometriia. Moscow, 1967. Bakhvalov, S. V., P. S. Modenov, and A. S. Parkhomenko. Sbornik zadach po analiticheskoi geometrii, 3rd ed. Moscow, 1964. Kletenik, D. V. Sbornik zadach po analiticheskoi geometrii, 9th ed. Moscow, 1967. The study of geometric figures and curves using a coordinate system and the methods of algebra. Also known as cartesian geometry. One of the objectives in coordinate geometry is to express geometric relations in terms of the coordinates of points. There really was no debate over whether coordinate geometry should be used, recalled Bob Daddow, Oakland County's project director for basemap conversion. A Windows-based coordinate geometry program, "Sight" Survey 2009 works with AutoCAD([R]) (version 2002 and newer), MicroStation([R]) (v8, XM, or PowerDraft) and IntelliCAD([R]), which comes built-in. In 1990, a major system expansion was made, adding more than 30 workstations, enhanced CADD design functionality, coordinate geometry ability right-of-way activities, and integration with mainframe-based attribute database files. I usually teach a transformation unit between coordinate geometry and trigonometry at a Year 10 level. This interesting problem has given rise to solutions involving trigonometry, coordinate geometry, similarity, and the Pythagorean theorem. Kaptein adds that the software runs completely in RAM, so it is faster for activities such as contour generations, elevation interpolations, cross-sections, coordinate geometry, and other functions than are computer-based surface modeling tools that run on top of CAD. At the core of Autodesk's land development design and analysis solution, Autodesk(R) Land Desktop delivers specialized features such as coordinate geometry (COGO) and map creation, terrain modeling, alignments, and parcels. Furthermore, grids and mosaics based on other types of shapes can be used, such as one based on squares leading in a natural way to area and to coordinate geometry, which connects shape and number. Use of Existing Mapping: Scanning, Automated Vectorization, and Coordinate Geometry. Coordinate geometry (COGO) capability transforms subdivision plans and metes and bounds descriptions into geographic information systems (GIS) data. One teacher recommended that we include Battleship because students needed more experience with coordinate geometry.